Many owners of old homes are disappointed to find out that someone painted over beautiful metal components at one time, either inadvertently or out of laziness. Figuring out how to remove paint from metal doesn't have to be complicated or expensive. In fact, an incredibly effective paint remover for metal is boiling water. 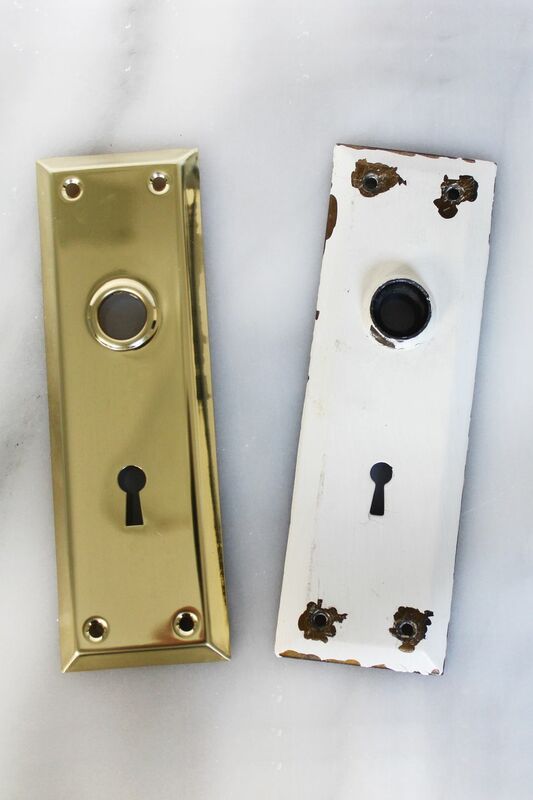 This technique is best for removing old paint from items like hardware, hinges, knobs, etc, and is likely the fastest, easiest, and cheapest option if done correctly. Find out how this process works and how to complete it without scratching or damaging the metal in question. You won't need many supplies to complete this project. To keep any potential lead paint away from cookware, we opted to use a disposable aluminum tin. Some people boil their metal for a longer period of time in a pot or crockpot. The choice is up to you. Just make sure that you dedicate the pot to this kind of work and do not use it to cook any food after this project. The first step is to bring water to a boil. Once you get a rolling boil, carefully and slowly pour the boiling water over the hardware. You can have the hardware in a pot, crockpot, or a disposable aluminum tin. If using a tin, make sure you have it doubled up and resting on something that won't get damaged by heat. If you opt to use a crockpot, turn it on high and let the hardware soak for 5 to 10 minutes. If you have your metal in a pot, simmer for the same amount of time. Most painted items won't need to sit this long unless there are a lot of layers or crevices where the paint is more stubborn. We opted not to simmer and just let the hardware sit in the tray filled with boiling water until the paint started to bubble. This took about five minutes. If you notice that the paint isn't bubbling, carefully fill the pan with more boiling water to reheat the metal. Once you notice the paint start to peel away, you can remove the items from the pot. Since we did not simmer on a stove or in a crockpot, we carefully started to scrape the paint in the tray while the hardware soaked in the water. Make sure to wear gloves and be careful not to burn yourself. When most of the paint is removed, take the metal item and carefully scrape away any leftover paint using a scraper or soft bristle brush. Avoid using items like steel wool or metal bristles because these can scratch the surface of the metal. In most cases, the metal is going to be tarnished underneath all that paint. Use a lint free cloth to buff off as much dirt, junk, and tarnish as possible. If you still have paint stuck in hard-to-reach spots, go back to step one and do the process over again. If you are going to add the hardware back to boiling water for a second time, consider adding baking soda into the mixture. The baking soda will help to dislodge stuck paint and will also work to clean the metal off tarnish. After all the paint has been removed, it's up to you to decide how you want to clean the metal. Some might want to leave the old metal components tarnished and darkened with age. Others might want their pieces to look brand new and opt to carefully remove all tarnish and signs of aging. A third option is to remove some but not all of the tarnish. This way, the items will still look old, but not quite as old. 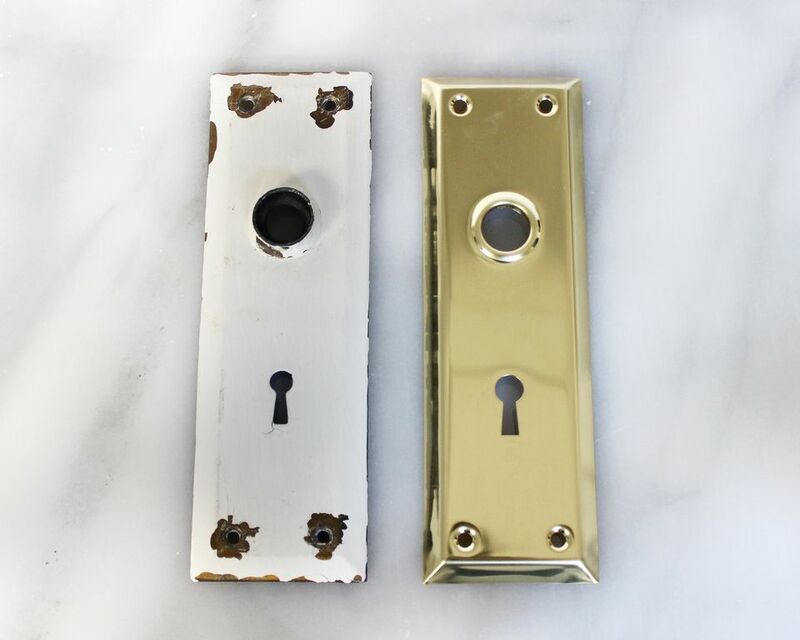 Consider leaving tarnish in recessed sections of the hardware by opting to polish only the raised sections. If you are trying to remove paint from larger metal pieces that won't fit inside a pot, try to use the most gentle paint stripper first. In most cases, you won't need a really heavy duty stripper to get the job done. What's the Best Paint for Furniture?